(8 February 2019) In an effort to strengthen its programmes for children, a new compendium of externally reviewed research and evaluation studies has been published by UNICEF’s Regional Office for Europe and Central Asia. The compendium of 20 recently completed, quality-assured evaluations aims to provide an overview of important new evidence from across the region. The variety of topics covered by the compendium reflects the array of issues affecting children in the region, with most of studies dedicated to the implementation of a justice system for children (Azerbaijan, Croatia, Bosnia and Herzegovina, and Serbia). Evaluations on early childhood development programmes in Kazakhstan, Montenegro, Macedonia, Serbia and Albania emphasize the need for more investment from stakeholders, policymakers and parents. Recommendations for ECD programmes across the region included to improve the targets and results architecture, encourage participation from children and empower parents, and to refine quality standards to continue to advance inclusive policies and practices across the region. 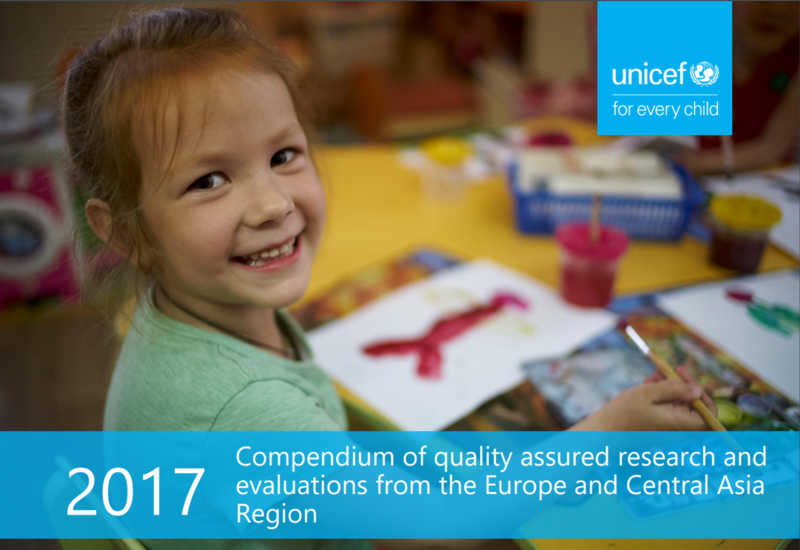 Top 20 quality-assured research and evaluations from across Europe and Central Asia are synthesized in a newly-published compendium presenting key findings and recommendations. The compendium also includes evaluations on newborn survival in Uzbekistan, ending violence against children in Serbia, refugee and migrant children in Italy and Greece, as well as child poverty and child labor, and gender disparities and adolescent wellbeing across the region. Among cross-sectoral research reported, the evaluation of “Breaking the cycle of exclusion for Roma children through Early Childhood Development and Education” – a multi-country project in the former Yugoslav Republic of Macedonia, Serbia and Albania – identified financial instability and educational level of parents as gaps contributing to the continuing cycle of exclusion for Roma children in the region. Read the report. The studies, all of which have passed through an external quality review and received satisfactory or highly satisfactory ratings, are grouped into themes: thriving, protecting, and cross-sectoral, to facilitate the use of specific and relevant key findings and recommendations across the region. The compendium, together with similar initiatives in other UNICEF regions, synthesizes important research findings and collates operational recommendations and lessons learned from a variety of evaluations. Its emphasis on methodology, conclusions, and recommendations highlights the vital part of using research and evidence as a base for shifting policy agendas and for influencing policies and programmes that benefit children. UNICEF Innocenti’s Best of UNICEF Research competition, which launched six years ago and pioneered this exercise, also highlights the best research from country and regional offices. The Best of UNICEF Research initiative celebrates its sixth year. Once again, it showcases a collection of the best research undertaken or supported by UNICEF staff and offices around the world. The ‘Best of UNICEF Research’ exercise has become eagerly anticipated throughout the organization. Staff in country offices particularly welcome the spotlight on work that helps to shape practice, programming and policy for children around the world. As evidence of this engagement, the number of submissions which come from all parts of UNICEF, including National Committees continues to rise, as does the diversity of topics and methods. This year, our highlighted research projects were selected from 104 eligible submissions. All regions were represented, as were most major areas of UNICEF programming. While fields such as health, nutrition, education and water, sanitation and hygiene (WASH) have generally been strong areas of evidence generation for UNICEF, it is encouraging to see child protection – a relatively underdeveloped field of research – showing prominently in the submitted projects, as well as an increase in cross-sectoral research.